Description: Cap: 3 to 11 cm; convex to broadly convex, occasionally nearly flat; whitish; smooth and glossy to fibrous to nearly wooly or scaly. Gills: free from the stem; deep pink becoming brown and then dark chocolate brown in maturity; crowded; covered with a thin white partial veil when in the button stage. Stem: 2 to 6 cm long; 1 to 2.5 cm thick; more or less equal; sometimes tapering slightly to base; with a quickly collapsing white ring; not bruising yellow. Flesh: thick and white throughout; not bruising yellow anywhere, even in the base of the stem; very rarely discoloring a pinkish wine color in wet weather. Spore print: chocolate brown. Odor and taste: pleasant and “mushroomy”. Habitat: Growing alone, gregariously, or sometimes in fairy rings, in meadows, fields, lawns, and grassy areas; late fall to early winter. 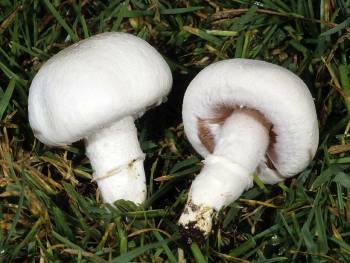 Primary Keys: grassland habitat, white cap, pink gills turning chocolate brown with age, fragile membrane and faint ring, “mushroom” smell (not phenolic or anise), not staining yellow. Notes: this is the most widely eaten European and American wild mushroom and is the closest cousin to commercial A. bisporus mushrooms, but with a much better flavor. The primary keys are critical for safe identification. A different odor or yellow staining could be a mildly toxic Agaricus, and white gills and/or a faint volva could be a deadly Amanita. Marinate the pork overnight in the refrigerator with the wine, coriander, cinnamon, salt and pepper. Drain meat and pat dry, reserving the marinade. Heat 2 T. oil in a large deep skillet (not cast iron) with fitting lid. Add the whole potatoes and lightly brown on all sides over medium-high heat. Remove potatoes and set aside. Add 2 more T. oil to pan and brown the pork on all sides. Remove pork and set aside with potatoes. Add last 2 T. oil and saute the onion until almost browned, then add the mushrooms and saute 2-3 minutes. Reduce heat to low, and add pork, potatoes and reserved marinade back to pan. Cover and simmer 45 minutes or until pork and potatoes are tender and sauce is very thick. Correct seasoning and serve with a tossed green salad.